I recently had the opportunity to hear our good friend Bruce Biegel of Winterberry Group speak to the Direct Marketing Club of New York (DMCNY). He talked about what happened in Direct and Digital Marketing in 2014 and what to expect in 2015. Overall, 2014 was a good year, which bodes well for 2015. Almost all aspects of direct and digital spend were up, and Biegel expects the trend to continue into 2015. 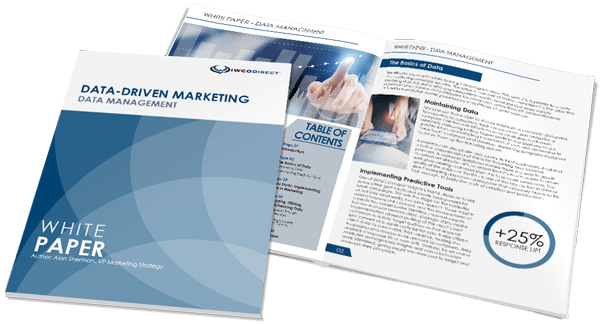 Let’s dive into the details of Winterberry’s direct and digital marketing outlook. Reflecting the strong correlation between GDP and marketing spend, 2014 pushed past a slow start to finish strong. Merger and acquisition activity related to direct and digital marketing was robust in 2014, which is a good sign that there is interest in our industry and cash available. Direct mail held its own in 2014. Postage hikes threatened, and volumes were down (although not as much as predicted), but direct mail continued to be a strong channel in acquisition marketing. That strength is driven by the fact that mail is a targeted, predictable and measurable medium that can be easily integrated with digital channels. Biegel also noted the importance of data in driving marketing strategy. He observed that online and offline data continued to merge, although activating data across channels is still a challenge. For that reason, Data Management Platforms (DMP) will be a huge growth area. Often, marketers have almost too much behavioral and interactive data, and they need tools to make this data “actionable” so they can create customer-centric, personalized, data-driven marketing campaigns. More than 75% of respondents to an online survey of marketers, advertisers, service providers, technologists and publishers are confident or extremely confident that data-driven marketing will continue its growth into the future. The majority say customer-centricity is the strongest factor driving continued investment in data-driven marketing. Biegel said all signs point to a strong 2015. Economic expansion, surging job creation and low oil prices will drive continued growth in direct and digital marketing, even though 2015 has no elections or global sports events to augment marketing activity. This expanding synergy between physical and digital communications will drive more “campaign orchestration” and execution. Marketers will see even better Return on Marketing Investment (ROMI) through the utilization of various channels all communicating and working together. Biegel also called 2015 a year of attribution and measurement. He said accurate, data-driven, cross-environment measurement and attribution has become a requirement for marketing campaigns. As you roll-out your marketing plans in 2015, consider IWCO Direct’s Proprietary Intelligence model. We can help you create campaigns guided by data-driven strategy, creatively executed, with the analysis and measurement you need on the back end to drive your marketing to even greater success.